Is a Long-term Gold Bear Market Possible? Thank you for publishing the Metals report. I was just wondering what would cause a bear market in gold , no one has really written or talked about what that would mean. Would it mean that we finally get to see behind the curtains as they try to turn the “ship” around….. ? ANSWER: Taking the metals down short-term is simply a function of further liquidation and a rising dollar. Long-term, I do not see where a return of a bear market is possible. The gold promoters talk about debt and hyperinflation. But that fails to look at real history rather than the few examples of revolutionary governments. The common bond between the hyperinflation of Germany, Hungary, Zimbabwe, France, and colonial America (Continental Dollars) is not paper money – it is the collapse in confidence in government. That unfolds in placed in Germany and Zimbabwe when there IS NO DEBT because people will not buy their bonds. When there is a debt and the government is an established one with power, they first turn against the people and hunt taxes, twist the rule of law so they win, and that creates deflation. The final nail comes like it did in the city of Mainz – no bid for the debt. 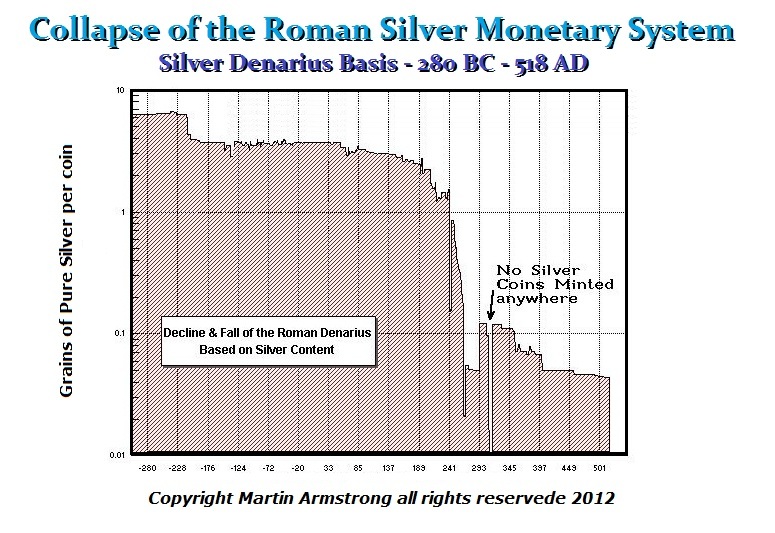 The assumption by the gold promoters has been they will just print more money to cover the debt. But honestly, that requires confidence to keep the game afoot. This is the common element. We will see the decline and fall in an OMG event and not progressive hyperinflation. France has already lost confidence of the people. Hollande has perhaps the lowest support number in all of history. But to save France, there will need to be another revolution for he is determined to stay where he is for the full term. France will crack and the EU may move to inflation BECAUSE they failed to establish a national debt market – one currency requires one debt and one government. As confidence in the EU is collapsing, now they are talking about issuing a national debt. But it is too late. They are exactly in the position of Germany and Zimbabwe compared to the USA which has a debt that is now supporting the world economy as reserves. There are important economic differences at stake here. This is not an issue of OPINION. There are serious structural differences that we will see as this unfolds. So I do not see gold entering a long-term bear market. We have downside to contend with, but this is how markets simply function. 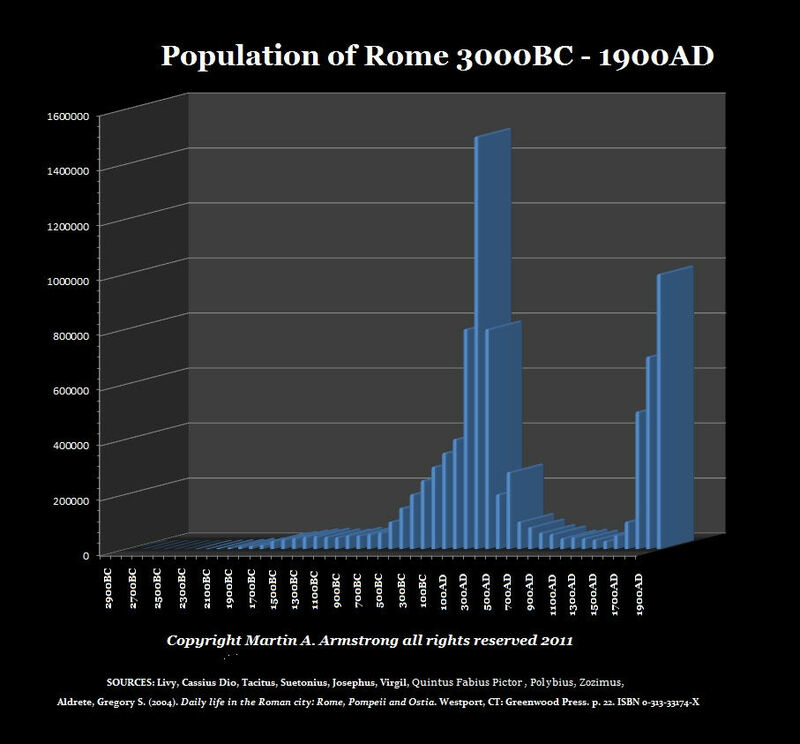 Rome kept raising taxes and twisting the law so people just walked away from their property. They could not pay the taxes and the population moved to the suburbs started farms and relied upon themselves returning to a Villa economy of self-sufficiency.This then was transformed into serfdom for protection from barbarian invasions. Taxes kill the economy and cause people to move just as I reported they are moving from North to South inside the USA. « Will the Demise be Plague or Economics?